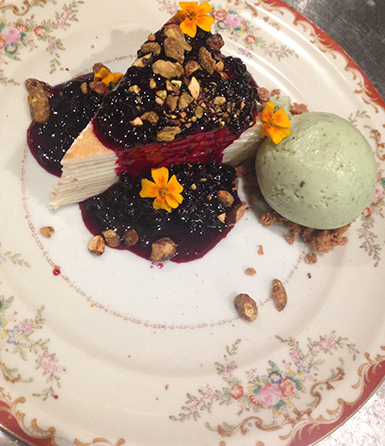 Dark and mysterious, huckleberries take the menu through an overgrown berry patch at dusk: far from the ordinary, a bit dangerous with the thorns and just to the edge of sweet obsession when paired with glittery beignets, fermented shrubs, campfire meringue and more. With so many berries vying to be the next “it” superfruit, from aronia to goji to good old blueberry, there’s one berry that stands out. Evocative of a magical Northern forest and a special time of year — nature’s limited-time offer — huckleberries are showing up on more menus — dessert and cocktail menus, especially — bringing their juicy magic to the table and unapologetically drizzling on the tablecloth with decadent deep-purple stains. Philip Pretty, chef, Restauration, Long Beach, Calif.
Chocolate glaçage, or “mirror glaze,” provides the shiny cloak on this complex dessert at The Caribbean Room, John Besh and Chris Lusk’s epic remake of a New Orleans classic restaurant on St. Charles Avenue in the Lower Garden District. 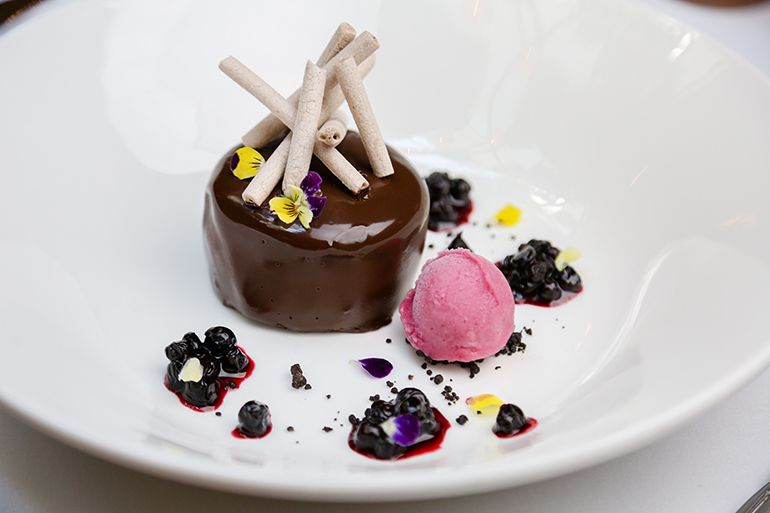 The complexity comes in layers: chocolate mousse and chocolate meringue make up the foundation, and the huckleberries are broken down into a deep, dark compote that’s crunched up with chocolate-almond crumbs. Chocolate meringue sticks allude to a smoky campfire and Muscadine sorbet, made with wine grapes with origins in the American South, adds to the mysterious vibe. In Greek mythology, Persephone — goddess of sunshine and spring weather — was kidnapped by Hades to the underworld and forced to return every fall, because she had tasted the forbidden fruit of the dead. 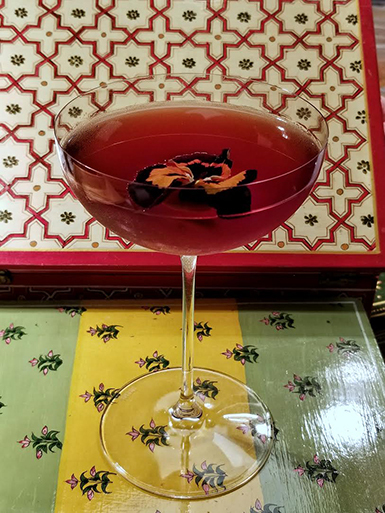 This cocktail puts an uplifting spin on the dark side of that myth with a cold fermented huckleberry shrub, lemongrass-infused gin, plum liqueur, Chartreuse, bitters and Douglas fir eau de vie. At Indian Accent, an inventive Indian restaurant with locations in New York, London and New Dehli, this mythical elixir shares company with other ambitious and fun cocktails and a full menu of globally influenced, dressed-up Indian comfort food. This over-the-top crepe torte contains 25 meticulously layered light-as-air ricotta crepes, lending an ethereal quality. 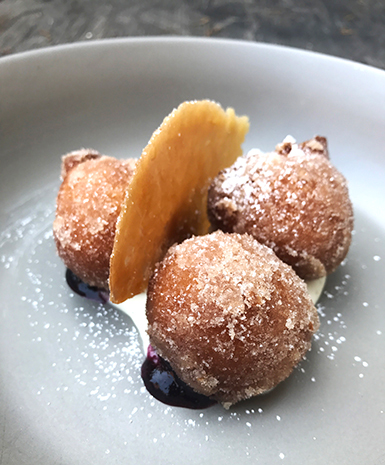 But this flagship dessert at Brian Malarkey’s chic, lofty, wood-fire-centric spot Herb & Wood in San Diego is grounded with an earthiness provided by huckleberry compote. Candied pistachios and pistachio gelato take the dessert in different, surprising direction.